John Wayne, Gary Cooper, Clint Eastwood. iemer is a man who has fire water in his cup and in his veins. A while back he was booted in the ankle by a horse. Right away, he knew it was broken. Not that he much cared. as the overcast sky; his mustache is worn like an upside-down horseshoe. It was weeks before Siemer got the break looked at by a doctor that didn’t come in a shot glass. The busted ankle was set in a hard cast. Only recently was Siemer downgraded to a fracture boot. He wore it out of the doctor’s office, but ditched it at first chance. “The only boots I wear are my cowboy boots,” Siemer says. iemer looks forward to Mondays. Unlike other people, for him Monday isn’t the day to kick off a work week. “I enjoy the company of others,” Siemer says. Gray State Park – and horses for sale. Everyone who stables a horse with Seimer knows the promise: if you can’t visit your horse three days a week, better board elsewhere. 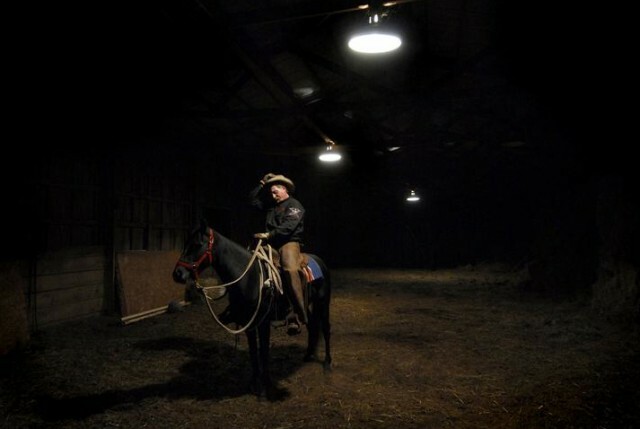 Siemer said there’s few things he enjoys more than teaching someone else the art of horsemanship. After all, such is his solace. iemer owns eight horses, but there’s only one he thinks of as a good buddy. He goes by Jack, and he’s a 13-year-old quarter horse the color of fertile earth. Siemer is applying an antiseptic to a wound Jack suffered a few days back. Siemer was called to retrieve some cattle that got away from a local farmer. Jack was gouged in the ankle by some barbed wire. If need be, Siemer would have stitched it himself. One minute of being ignored, and Jack is employing his snout to knock over a shovel. Today, Siemer isn’t in the mood for funny business. He’s running on four hours sleep in three days. Siemer’s father needed him to relocate 500 head of cattle to another farm in Princeton, Mo. Four hundred or so were loaded up and hauled in trailers. The rest were transported the old-fashioned way. Siemer took several horses with him for the cattle drive and recruited 15 of the finest riders he knew. One of them kicked a mare called Rhapsody in the ribs; none were broken. Seimer bought Rhapsody because of her bloodline, which traces back to one of the first horses he ever knew. iemer boasts that he can break any horse, no matter its temperament. At the moment, he’s training four horses, none of whom compare to a Palmetto mare he had several years back. The 5-year-old horse was raised by the Amish, renowned for the physical demands they place on farm animals. This horse was no exception. A man had dropped the horse off assuming it was without hope. Early on, Siemer escorted the mare to a small pen and, as soon as he closed the gate behind him, it leapt over him – and the fence. After bringing it back to the pen, Siemer saddled the horse, climbed aboard and – after nearly getting bucked – was able to bring calm. Siemer says his grandfather also taught him patience. Another horse infamous for its foul temperament was Jack. Siemer knew the horse sounded familiar when he got a call from a man he’d done construction for who’d bought a horse so big a rascal it warranted a private fence. He asked if Siemer could right the horse. He said he’d give it a try. Upon arrival, Siemer recognized the horse. Siemer had trained the horse for a woman who gifted it to her granddaughter. The horse hadn’t lasted but a few years before it was on the market. Now, it was set to be sold again. The man complained the horse bucked. Seimer corrected him. The man had lost all patience and offered to sell to Seimer, who was obliged. The Seimer family owns a small pet cemetery where only the friendliest animals are buried. But Jack’s demise is not a matter for today; virtually all the horses in the cemetery were in their 30s when they passed. Jack, meanwhile, has heard enough. He stomps his foot in protest. “You’re just begging to hit that trail, aren’t you?” says Seimer, laughing. eimer is, in many ways, a vision from the past. He’d be a better fit for the mid to late 1800s (in fact, he made a cameo in “Ride with the Devil,” a film set along the Missouri-Kansas border during the Civil War). One need not look at his face to surmise as much: his fingers and knuckles are ravaged by scabs and scars. Seimer says his favorite thing about living in the Midwest is the winters, when he can hitch a horseback ride during a snowfall. “When everything has that blanket of white on it, it’s like you’re in a different time,” he says. Step onto the grounds of his ranch, and you’ll know what he means. A simple barn surrounded by open country. No noise save the wind scratching against wheat. And then there’s a voice. A baritone as deep as a river channel. It’s that of a girl who’s learning to ride for the first time.